This is a view of the Atlanta skyline at dawn last Saturday. We had a great time in Atlanta. We toured CNN, visited the Georgia Aquarium and World of Coke, and headed out to Stone Mountain for sunset. My favorite thing was easily World of Coke. I’m acutely aware that World of Coke is one big advertisement for Coca-Cola (you have to pay to be advertised to! ), but it’s brilliant in its execution and well worth experiencing. It reminded me a bit of Walt Disney World in that sense. No sense delving into that now, though; I’ll hit on that subject when I share some shots from World of Coke. As for this photo, I happened upon a bridge with this view of the Atlanta skyline the previous night when I made a late night run to The Varsity (thanks for the tip from reader Rachel M!). The Varsity was pretty good; more the type of restaurant you visit when in a certain location because of the lore behind the place. The view, on the other hand, was great. The bridge offering this view was fenced, which I initially thought would thwart my attempts at photography, but after walking it, I discovered a lens-size hole in the fence! Normally, I don’t condone destruction of public property, but thanks to whomever cut a hole in that fence. My not-so-trusty sunrise app indicated to me that the sunrise the next morning would be right behind those buildings, so I decided to come back from twilight and sunrise the next morning. For a southern city, Atlanta was surprisingly cold, and after standing in this spot for a while, I discovered that the sunrise would not be directly behind the buildings. Oh well, I think this twilight photo turned out fairly well. Photographed with a Nikon D600 and the Nikon 28-300mm VR lens. This was my first chance to process an image taken with this new lens of mine, and I’m fairly pleased. It’s not as sharp as any lens in the Nikon Holy Trinity, but it’s much better than your average super-zoom. My main motivation for getting it was next month in Yosemite National Park, where I suspect it will be too cold to frequently chance lenses, and some scenes will call for both telephoto and wide angle. In Atlanta, the super-zoom wasn’t necessary, but I wanted to test it to make sure it was up to snuff before using it on an important shoot. In post processing, I first used Adobe Camera Raw to adjust the white balance, fill light, and exposure. In Photoshop CS6, I combined two exposures to tame some of the highlights (the billboard and some of the traffic lights). For finishing, I applied a couple of curves adjustments (a stronger one for the traffic) and also applied a warming filter adjustment layer to the building. I did this because the blue of the sky was really, really vibrant, and this was also visible in the buildings. Blue hour photos typically have a deep blue color when without increasing vibrance, and I typically try to tone this down a bit. Even though it’s what the camera sees, it doesn’t always look realistic to our eyes, which don’t see the same deep blue colors in the sky. Any fans of “The A-T-L” (aka “Hotlanta,” aka “The Dirty South”) out there? What is your preferred nickname for Atlanta? What do you think of the city? Share your thoughts in the comments! I really enjoy your websites (especially Disney Tourist), but are there going to be any more articles on atl? You have quite a few other places to visit next time you’re there! That’s an excellent name. I’ll have to remember that for the next photo. Much like a rapper, it seems like Atlanta has a thousand nicknames. I am so glad you are now branching out on your blog. I’m a huge fan of your photography and the Disney tourist blog and a follower on instagram. I grew up in Gainesville, GA which is just north of Atl. I love the Varsity! But I am not a snobby foodie. The frosted orange is my favorite. My mom grew up in Atlanta when the Varsity was young and hip so it holds a special place in my heart. I just visited the GA aquarium with my kids this month and it was amazing! The ocean voyager viewing window in my favorite spot. If I ever get to visit by myself I think I could sit here for hours… We also love the World of Coke. I love hour they have added the Vault to the area. My kids favorite spot is the tasting room. We could spend a day just tasting the varieties. 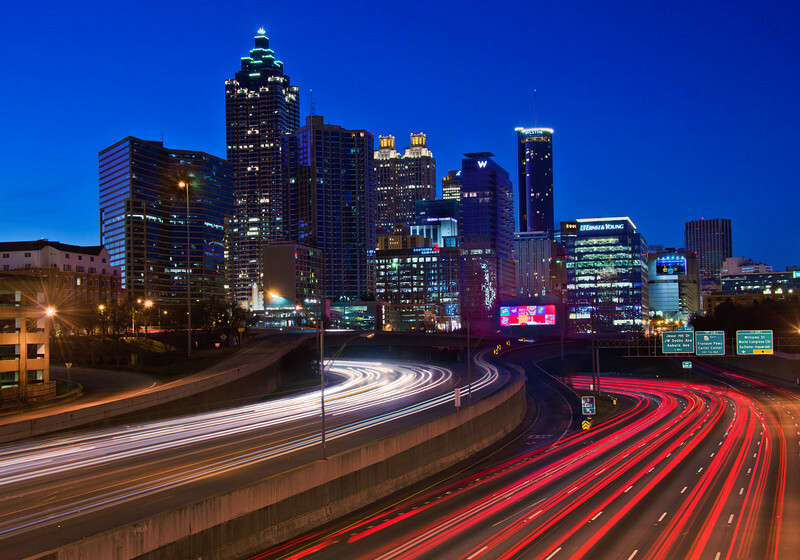 Love the photos of Atl! Cant wait to see your next adventure. LOL! No. Just saying I love my Varsity. But there are plenty of great restaurants in ATL if V is not your type of food. But I still think a stop at the Varsity is a must if you visit ATL. And then you have to add a visit to the Dwarf House in Hapeville which is the original Chick fil A. And you have to go through the tiny red door! I am not an Atlanta fan after being trapped there for days while we learned the hard way that if you try to fly stand-by to the Virgin Islands that you will never get there. We’ll be in Cincinnati next Saturday, so hopefully I’ll have a chance to photograph the skyline. Any recommendations? You mentioned you have a not-so-trusty sunrise app. Do you know of a much-more-trusty sunrise/sunset app? I’m hoping to capture some sunrise/sunset photos during spring break on the beach at Lido Key in Florida. I am curious to hear your thoughts on Georgia Aquarium! My parents moved to Western South Carolina 2 summers ago and I have since dragged them to the aquarium two times. Therefore, any pictures and/or commentary would be HIGHLY entertaining for me! I’ll share my thoughts on the Aquarium in an upcoming post! I’m a huge fan of your photography, Tom. I’ve lived in Atlanta my entire life and have been on this bridge numerous times due to its proximity to Georgia Tech, The Varsity, and The Fox Theatre. This photo is a BEAUTIFUL shot of the otherwise, in my opinion, very ugly skyline. Although you might find it a little more appealing since you don’t have to sit in traffic looking at it everyday. I’m really liking the new blog, though I must admit my heart will always go for Disney! Love the technical information from a more experienced Nikon user!! Wish I could’ve seen the Fox Theatre…maybe next time we’ll have more time to spend in the city!